I have built a form using lightning-record-edit-form & have added a button to it using lightning-button. I want the button to have 100% width, so I added a class to lightning-button that sets display:block and width:100% but I'm not getting the results I was hoping for. And here's a screenshot of the result in the console. As you can see, lightning-button element has been set to 100% width, but the underlying button element has not. Does anyone have any advice on how to set the underlying button's width to 100%? You can't style the underlying button of a <lightning-button>. As glls pointed out below and elsewhere, you can't style child components from parents (or siblings for that matter) due to LWC's use of Shadow DOM. When you apply the classes below to the lightning-button, you actually get a "button" within a button, as you can kind of see in the screenshot of the LWC Button and can see more clearly when using developer tools to inspect the elements. the first button is the namespaced lighnting-button component, the second one is the slds blueprint. Cannot change the css of the lightning-tabset standard web component? 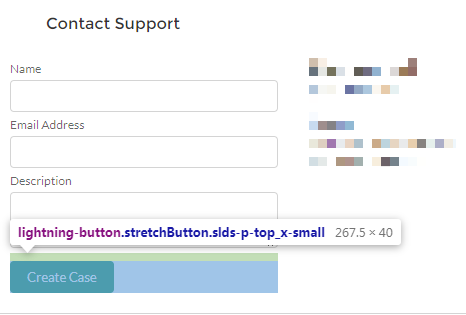 How can I call @wire(getListUi) method on button click? Lightning Web Component: how can I use Get Child Records UI API? How to make rich text input work with lightning-record-edit form in lwc? How to extend the rich text input of lwc with custom buttons to add new commands? Assign content to multiple slots in LWC: how to insert the same slot content to multiple template slots in LWC?